How to make money selling on eBay: it’s one of the most perplexing things since the online auction website became huge over 20 years ago. How does one actually make a living just from selling things online? Well, it can be done. Experts all over the web have shared their impressive incomes from eBay alone – we’re talking tens of thousands of dollars just from selling on eBay! They may answer, “How much money you can you make on eBay?”. But, it’s rare that you’ll ever catch them telling you how to make that money. Lucky for you, I’m going to divulge some of the secrets. I’ve actually been an eBay seller for about 15 years now. Although I don’t have the desire to make it my full-time job (silly, I know), I do know that you can make a pretty penny if you’re willing to do the work! So, here’s a step-by-step guide with helpful tips to get you started on your journey to rake in the big bucks from eBay. Before we get too ahead of ourselves, it’s best to learn as much as you can about eBay and how the site works. 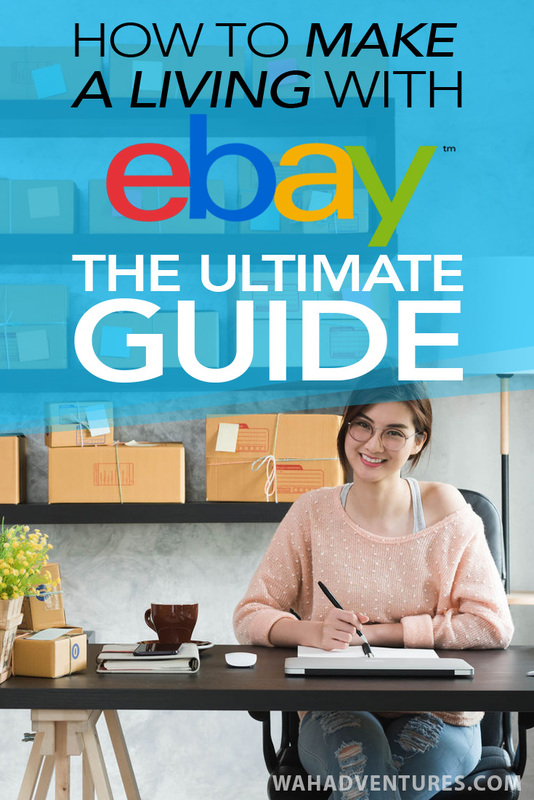 What’s great about eBay is it has tons of helpful guides to get you started as a beginner, as well as more advanced guides once you gain some experience. First, tour the website. If you’re not familiar with buying anything from eBay, now is a good time to start. You’ll want to know how the website works for buyers so you can understand how to sell items to buyers. Check out the categories and browse through some of the items people are selling. Then, take a look at some listings. Notice what makes a good, detailed listing, like plenty of photos, a thorough description, and item specifics. Think about what you’d want to see as a buyer. Next, familiarize yourself with seller’s fees. It’s free to open an eBay account, but you’ll be responsible for the fees associated with each item that sells. Fortunately, eBay has a handy fee calculator that helps you figure out what your estimated costs for your listings will be. You’ll also need to get a feel for your potential shipping costs, since fees and shipping can absolutely eat away at your profits if you’re not careful. It’s best to sell items that you can mail for the lowest shipping costs so you can make the most profit. Research the costs for your location before you start selling. If shipping internationally, eBay has a Global Shipping Program that lets you ship your item to a local warehouse and it takes care of shipping it internationally for you. That’s one big stressor off your back! Once you feel more familiar with eBay, you can start off small by selling some things you already have. Think: toys, electronics, or even old car parts you have lying around. Selling some things you no longer need is the best way for you to get a better feel for eBay as a seller and gain some confidence in doing so. Include plenty of photos. You’re allowed to have up to 12 photos for free on your listings. Make sure they’re high-quality and clear. Make detailed descriptions. Your listings should be very clear as to what you’re selling and the condition it’s in. Be completely honest so you won’t have to deal with complaints later. Use keywords. Think about what you’d search for if you were searching for the item and use those terms in your title and listing. Use $0.99 as a starting price. Most sellers agree that starting an auction at $0.99 is a must if you want it to sell. Most of the time, once the first bid is in, the price rises rapidly and you won’t usually get stuck selling something for its starting price. Stay away from reserve prices. Reserve pricing lets you ensure that an item doesn’t sell for less than you want it to. But, it also scares buyers away from bidding. It’s best not to use it. Research your items both for prices and descriptions. Get the model number, if possible, so you can include it in your description. Do some price research to find out what it’s going for on eBay and other sites. You’d probably be surprised by what you can sell unneeded items around your home for. But, if you think there’s a market for it, there probably is, so it’s worth a try! Plus, it gives you some experience on eBay and the chance to get some awesome feedback before you start selling higher-priced items. Now you’re a bit more confident in your selling abilities, so it’s time to turn this into a real profit-maker. Some of the best eBay sellers spend at least a day or two per week scouring yard sales, flea markets, and newspaper or online classifieds websites like Craigslist. You can often find awesome items to sell at super low prices from people who just want to get rid of them. The Freebie section of your newspaper or Craigslist may also turn up some gems that will get you a profit no matter what you sell it for! Think of this as a bridge between selling your own items (which eventually you’ll run out of!) and spending money for higher-priced items to turn a profit. Good things to look for are clothing, baby gear, electronics, and books. Clothing is one of the first things I started selling, and it’s amazing how much you can make off clothing that people practically give away. Name brands, especially, can turn an excellent profit even if they’re used, as long as they’re in great condition. Make sure you wash everything first before selling it and take close-up photos of any small stains or tears. Zoning in on what you want to continue to sell is half the battle! But, you can figure out what might be best for you based on what you’ve sold already. What did well, and what didn’t do so well? It’s equally as important to find your niche in something you love selling. The more interest you have in it, the more people will feel your passion in your photos and descriptions. Why is choosing a niche important? It helps you focus your eBay selling into more of a business and brand and gives you a better focus for your store, which we’ll get into soon. Plus, you can spend less time researching products and prices if you only have a certain type of product you need to research. Some experts believe it’s important to pick two or three niches, though. Sometimes, a certain type of product is trendy and profitable for a while, but soon dies down. If that happens to the product you focus on, it’s good to have a backup in place. After you have your main niche and products figured out, you can open a store on eBay! eBay stores have a way of instantly building your credibility as a seller. People can see that you’re not a scammer trying to get a quick dollar, but instead have several products to sell. Additionally, your fees as a store owner are lower than individual seller fees, which means an increase in profits for you. Best of all, eBay will send your store to the search engines, so people searching for items you sell can find your listings more easily. More exposure, again, means more profits! Simply, if you want to make a living selling eBay items, a store will get you a big leap closer. Now comes a tricky part of the process: pricing. You have a store and your products figured out, but how should you price them? On eBay, you have two choices: you can have customers bid on items or you can have them buy items for a fixed price. If you allow them to buy, you can also have them send you a ‘best offer’ price. The pricing model you choose will largely depend on what you’re selling. If you have products you simply can’t risk parting with for a few dollars, you can opt for fixed price. But, fixed price limits your possible profits. You may not think so, but those earrings you didn’t think would sell for more than $20 could have raised to $100 in an auction. You never know! That’s the magic of eBay. The best thing to do is to research using both eBay and other websites. Google your products and see what they’re going for, and then search for them on eBay. You may notice quite a difference between eBay’s prices and other websites’ prices. It’s good to have a ballpark estimate of your products’ worth, but remember that, ultimately, you’re selling on eBay. So, you need to make your prices competitive with eBay’s prices. Generally, if your item isn’t commonly found on eBay, an auction is the best way to go. But, a fixed price listing can help you earn a profit on more commonly listed items by allowing you to stay competitively-priced. Once you start making money and have some to invest in your business, it’s a good idea to keep your eyes peeled for unique things that can really take your selling to another level. Unique stuff sells, especially on eBay. Think: collector’s items, vintage items, artwork – anything people can’t find just anywhere. Of course, you’ll need a little money to start buying unique items to sell. But, if you pay special attention to store closeouts, price drops, and thrift store sales, you could find really great items that can go for high prices on eBay. If you’re spending more for an item, you might want to use a fixed price listing to make sure you’re getting what you want for the item. If it doesn’t sell at that price after trying a couple of times, you can always lower it a bit, but at least you won’t lose a bunch of money! One thing the big sellers on eBay know how to do well is time their listings to get the most profit, especially with auctions. At the end of an auction, usually within the last couple of hours, is when you’ll usually see the biggest influx of bidders. This is when they start competing to be the final winner of the item. Depending on where you live, you’ll want to time the auction so that it ends during a busy period that most people would be browsing, like a weekend or evening times. Also, starting any listing on a Thursday and running it for 10 days gives your listing two full weekends, which are the busiest times for eBay visitors to come to the site, to get seen by potential buyers! You can play around with times and days to see what works best for you, but always keep the convenience of the buyer in mind to target the best times. Customer service will make or break your eBay business. Many buyers rely on the feedback you have to decide whether they want to make a purchase from you. Less than awesome feedback will have a huge effect on how successful you are. One of the best things you can do is an eBay seller is to immediately provide positive feedback for sellers if you had a great experience with them (like not having to hassle them to pay!). When you provide feedback, it encourages your buyers to provide feedback for you. You also can, and should, request feedback from buyers who haven’t yet provided any. People forget sometimes, so a friendly reminder can encourage them to leave a quick note about their awesome experience. If you do reach out to them, remind them that you’re willing to correct any problems that might have occurred to ensure they’re happy in the end. This is one way to ensure five-star feedback! Being a super-fast shipper. Your buyers want their items yesterday. Get them shipped as soon as possible and it’ll do wonders for your business! Provide a clear return policy. No seller wants to go through the hassle of returns, but it’s best to have a policy in place so you can keep customers happy. You’ll likely get more business if customers know they can count on you if they have an issue. Be quick to answer complaints. You don’t have to live and breathe eBay. But, make sure you check your inbox a couple of times each day so you can quickly answer any questions or complaints you have from buyers. It’s important to remember that you now have a real business. It’s time to start treating it like one! With a home business comes some responsibilities, like taxes and following the legislation for home businesses in your locality. Once you start making regular income on eBay, you’ll need to check your local requirements for filing as a business, including any permits you might need. This is usually pretty easy as long as you don’t have employees working for you and customers coming in and out of your home. That’s the beauty of an online business! Also, you’ll need to learn the tax laws for your area. In the United States, you’re required to pay self-employment taxes in addition to your income taxes. How to Make Money on eBay: It’s Your Turn! I think it’s safe to say that we’ve answered the question, “Can you make a living from eBay?”! More and more people are jumping on the bandwagon for good reason: eBay selling is a lucrative business when done right! Take the tips I’ve given you and hit the ground running. I want to know how you do in your eBay money-making journey. Let us know your story in a comment!